Real Madrid began their La Liga title defence with a 3-0 victory over Deportivo La Coruna. Gareth Bale scored and Sergio Ramos saw red card as Real Madrid swept to a confident 3-0 away victory over Deportivo La Coruna to open their LaLiga title defence. Casemiro, in with Bale as two of four changes from the Supercopa de Espana second-leg victory over Barcelona, added to his UEFA Super Cup goal against Manchester United by capping a brilliant Madrid passing move to double the visitors’ lead. Ramos was fortunate not to be sent off for putting his hand to the face of Depor defender Fabian Schar after the break, but the captain was perhaps unlucky to receive a second yellow card in stoppage time. Toni Kroos’ deflected strike had already sealed an impressive victory, which came without suspended star Cristiano Ronaldo and was capped by Florin Andone’s late penalty miss, ensuring Madrid went straight to the top of the table after title rivals Barca defeated Real Betis 2-0 at home earlier on Sunday. Madrid have now won 13 of their last 14 league games against Depor as they bid to win back-to-back LaLiga titles for the first time since 2008. Andone, linked with a Deportivo exit, failed to convert two excellent early chances. The striker created the first himself, battling past Dani Carvajal, who claimed for a foul, and forcing Keylor Navas into a good diving save from a tight angle. Andone then missed an even better opportunity, racing through on goal in oceans of space after Juanfran’s througball, but failing to beat Navas as the Madrid goalkeeper again got down to deny him. Those squandered chances proved costly when Madrid moved ahead in the 20th minute. 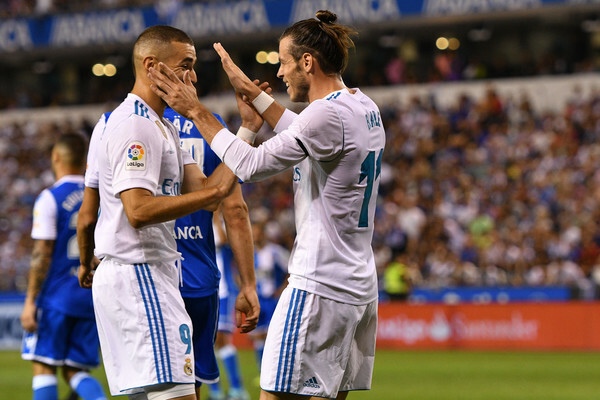 Luka Modric’s shot from 20 yards was poorly dealt with by Depor goalkeeper Ruben Martinez, with Karim Benzema’s touch on the rebound allowing Bale to slam in the simplest of finishes from two yards. Seven minutes later, Madrid doubled their lead with another close-range finish, but this time it capped a magnificent move that saw Madrid complete 44 passes before Casemiro tapped in after Marcelo worked space against Juanfran and delivered a threatening low cross. Ramos had a lucky escape early in the second half when he was only shown a yellow card for raising his hand to the face of Schar, who was also booked, as the pair argued over whether Madrid should have kicked the ball out of play while Zakaria Bakkali was down injured. Depor’s frustration grew when the Madrid captain then made a crucial goal-line clearance to keep out Andone’s impressive header from Bruno Gama’s cross. And the visitors ended the game as a contest after 62 minutes, another swift passing sequence resulting in Bale setting up Kroos to fire in from 18 yards, with the aid of a deflection off Schar. The hosts almost got one back when Guilherme turned in the box and fired a powerful effort against the crossbar. Depor had an even better chance to end the match with a goal after being awarded an 89th-minute spot-kick when Carvajal took out Gama from behind, but Andone produced a dreadful effort that looked to be drifting off target before Navas got a faint touch to make sure he claimed a clean sheet. But there was some frustration for Zidane, with Ramos, who had been fortunate earlier, dismissed in the second minute of added time after catching substitute Borja Valle with an arm in an aerial duel.